On his weekly Brian Lehrer show appearance this morning, Mayor de Blasio said the city is fully funding Vision Zero street redesigns. The numbers tell a different story. During the Q&A segment, Families for Safe Streets member Mary Beth Kelly told de Blasio 204 people walking and biking have been killed by drivers on Vision Zero priority corridors since January 2015, and that only a fourth of those corridors have received redesign treatments. 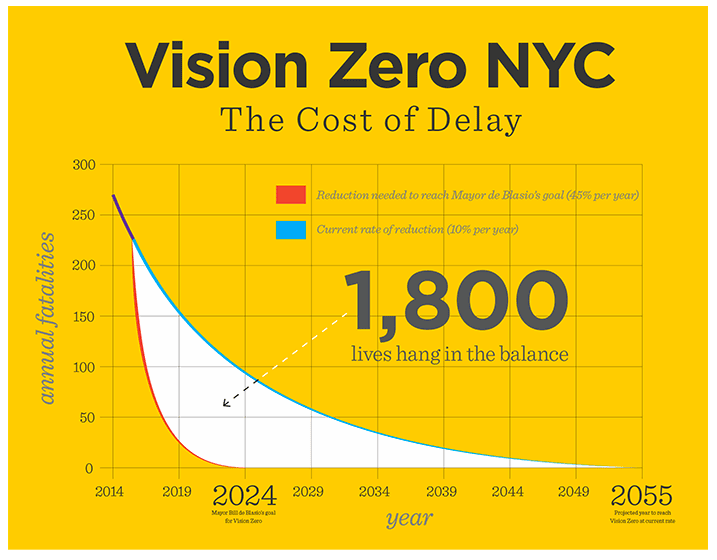 Kelly asked the mayor to commit to speeding up funding for Vision Zero priority projects. I appreciate the question very much and I appreciate the work that you do and your colleagues do because it’s been decisive to Vision Zero, particularly in terms of the fights you’ve waged in Albany to get us things like the speed cameras around schools. And we want to do even more of that, and I’m very hopeful there is a Democratic Senate. There’ll be a willingness to go farther with us in protecting kids and seniors and implementing Vision Zero. We are very aggressively moving those safety redesign efforts. There’s no lack of funding, and there’s no lack of will. And you know Queens Boulevard is a huge example of this, a place we used call the ‘Boulevard of Death’ and thank god we have not fatalities the last two years because we’re doing redesign, because of bike lanes, because of the reduction in speed limit, because we’re enforcing the speed limit with the NYPD. So we’re very, very adamant about moving these as quickly as possible. I’ll talk to Commissioner Trottenberg to see if there’s anything else that she needs to continue to speed things up, but she’s gotten the order from me to do everything as quickly as humanly possible. We will also be doing more enforcement. The NYPD is continuing to ratchet up enforcement on speeding and on failure to yield, and you’re going to see more checkpoints as well to inhibit drunk driving. So there’s a lot of Vision Zero pieces that are going to be growing, and the redesigns are absolutely a priority. Budget figures don’t back up the mayor’s claims. As Streetsblog has reported, last spring Transportation Alternatives found that at the current rate of funding it will take almost 40 years to redesign the priority corridors identified in the DOT’s pedestrian safety action plans — a timetable that stretches decades beyond the Vision Zero goal of eliminating traffic deaths by 2024. After TA released its analysis and called on officials to act, the City Council recommended increasing the DOT budget for quick-to-implement “operational” projects by about 25 percent. The council also proposed $250 million in annual capital funding for redesign projects. De Blasio declined to follow the council’s recommendations. Yesterday Families for Safe Streets and TA rallied on the steps of City Hall to urge de Blasio to ramp up street safety funding, after two children were killed last week by reckless drivers in Queens. The mayor says he’s doing everything he can, but his budget says otherwise. Is it this mechanical- that street designs that cost x amount of $ lead to x # of deaths reduced? I love me some redesigned streets, but there is a culture of unsafe driving that no amount of engineering can end. Street design is the easiest way to get people to drive safer. Look at Manhattan and observe the difference between how people drive on the one-way crosstown streets (which are typically two parking lanes and one travel lane) and how they drive on the avenues and wider multi-lane two-way crosstown streets (86th, etc). Reconfiguring streets forces a cultural change in the way people drive. Fixing street design is the way to go. Just think of the avenues in Manhattan. They’re freaking designed like highways. I, at night, when driving, honestly feel comfortable going at or around 40+ mph. Just putting up some signs that say, “25 mph speed limit,” won’t change the driving culture or behavior at all. But designing the road, such that, it’s narrower, has more physical obstacles (tree, boulevard medians, other physical barriers) that signals to the driver, that you’re not on a 5 lane highway, but you’re driving through a residential neighborhood. Especially thinking of Manhattan avenues, having curb extensions on every intersection and other physical barriers such that cars cannot take turns at high speeds, would for sure eliminate traffic deaths including a few recent ones involving seniors in crosswalks. We know driving culture can be very unsafe and having roads designed like highways in dense urban residential environments is a recipe for deaths. Sounds like de Blasio has given Trottenberg the order to not capitulate to NIMBY community boards. That should be all the political cover she needs. They should be held to this. Giving motorists more information is important, also. When you redesign the avenues for slower speeds you should retime the lights for those speeds AND make that information readily available to drivers. Have numerical displays which show the speed you need to drive at to make the next light. When drivers see they can go 22 mph and still safely make the next light the urgency to mindlessly gun it will eventually disappear. I personally find it amazing motorists aren’t more in tune with light timing on streets they use every day but maybe that’s something only cyclists tend to keep tabs on. If you post the information right there motorists might finally figure it out. I want to believe that design is destiny, I really do. But when I see motorists blast down tiny, narrow NW Bronx local streets at 40mph and fly over the shallow speedbumps installed on the street a few years back, I’m skeptical that we can design our way out of a toxic, unaccountable road culture. They won’t be driving for long hitting speed humps at that speed. Damage to the suspension, frame, wheels and tires. Likely to lose control. I once saw an Escalade lose its entire front bumper hitting a speed hump at an unreasonable speed (40ish?). Vehicle was immobilized as the bumper was crushed, dragged and jammed into the wheel well/fender. I would love to see some chicanes, traffic diverters, neighborhood traffic circles etc. NYC DOT removed the Slow Zone signs from the roadway because people kept hitting them. Make them heavier. Add traffic calming that you have to actively avoid. Folks would learn to drive slow and pay attention pretty fast. What’s his motivation here? Why reject the safety money? I just don’t get it. Does anyone have insider info on this? Right! I really don’t understand the politics of it at all! 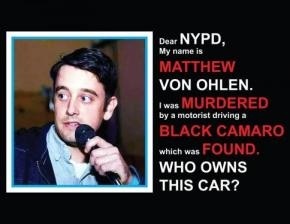 He’s a coward so he defers and delegates to the NYPD and developers. Annoying but he’s a poor leader. But here, he has his own city council, asking for additional funds to finance one of his signature proposals. The amount of money requested is a rounding error but would provide for a lot of help. City Hall actually has a fair bit of cash. And he’s expanding the NYPD too! I just don’t get why he’d knee cap one of his [failing] signature policies. That video was beautiful. Thank you. My guess: DeBlasio fears a situation where he is blamed for being a spendthrift who bankrupted the city. He wants to hold the line on spending here and there, so when the tax revenue stops gushing in people won’t blame him for the shitstorm. And it may be coming. He cut contracts with the unions that defer the big pay raises until after he is re-elected. But the pirates of Wall Street are finding out what happens to top predators when the bottom of the food chain is killed off due to excess predation, and the growth of tax revenues has stopped. Meanwhile, the financial asset bubble caused by zero interest rates has plateaued — and it sucked all the future gains out of the pension funds. As for the NYPD, that was idiotic but imposed on him. He decided not to to play the stupid game where he proposes fake cuts to the parks and libraries and the Council restores them. So the Council demanded 1,000 more cops instead.